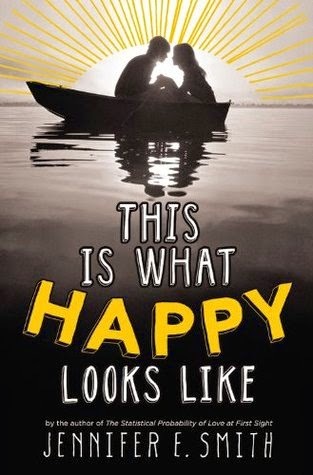 This Is What Happy Looks Like was a quick, predictable, romance read but it didn’t quite have the ‘awwww’ moments that I so desperately wanted. Having read and enjoyed The Statistical Probability of Love at First Sight, I was keen to try another, longer, novel by Jennifer E. Smith. This Is What Happy Looks Like was a quick, predictable, romance read but it didn’t quite have the ‘awwww’ moments that I so desperately wanted and that I found in Statistical Probability. This Is What Happy Looks Like was a nice enough story, and the adorable and totally random prologue gave me hope, but unfortunately the almost 400 pages that followed just didn’t quite hit the mark for me. Reading it, I found myself skimming pages, hoping to find something ‘more’ but unfortunately it just didn’t happen. Ellie and Graham are quite endearing and I think I could have warmed to them more if I had had a chance to get to know them through their emails, the same way we are told they got to know each other. Instead, after their initial emails (the prologue), we are thrown straight into their first meet-up and the predictable problems surrounding that and I don’t think that as the reader we feel invested or enthusiastic enough about their relationship to really care where the story goes. Thankfully, this has not deterred me from trying the other Jennifer E. Smith novels I have in my possession. I can only hope they resemble The Statistical Probability instead. Yeah, I started this but never finished it. I would have loved to see a book about two teenagers balancing a long-distance relationship that started over the Internet (timezones and all) but then it fell into more of the typical summer romance story.